This blog post is a walkthrough of how to easily move from variable replacement to OpenDoPE content control data binding. Variable replacement is quite a popular way to get started generating Word documents. I guess that’s because developers expect this sort of approach to be available, and its easy: all you have to do is add your variables to the document, then bang, you replace them. variable replacement is great if you just want to replace text, but what if you want to replace images, conditionally include/exclude content, or repeat table rows or list entries? Content control data binding is a great solution to these problems. Some users create very complex contracts and reports this way. The good news is that docx4j contains code to automatically migrate a document which has variables on its surface, to one which contains OpenDoPE content controls. Have a look at the main method to see how to use it. There have been some fixes recently, so you should use docx4j-nightly-20180428.jar (or 3.3.8 when released) or later. OK, let’s assume you now have a docx file with content controls in it. You may want to further develop your template. For this you need an OpenDoPE Authoring tool. The friendliest OpenDoPE authoring tool is the “No-XML” Word AddIn. With this it is very easy to add conditions, but the limitation is that it assumes a fixed XML format. If you want to use your own XML format (or to bind escaped XHTML I suspect), you’ll need to use one of the older add ins. Here we’ll walk through adding a condition with “No XML” add in. I had pressed the “Show tags” button to be able to see the content controls in orange above. 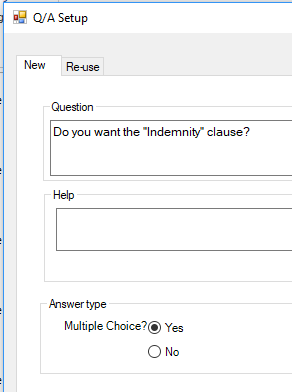 Further down, there’s an optional Indemnity clause. Since its optional, let’s wrap that in a conditional content control. First, we need a question “Do you want the Indemnity”. 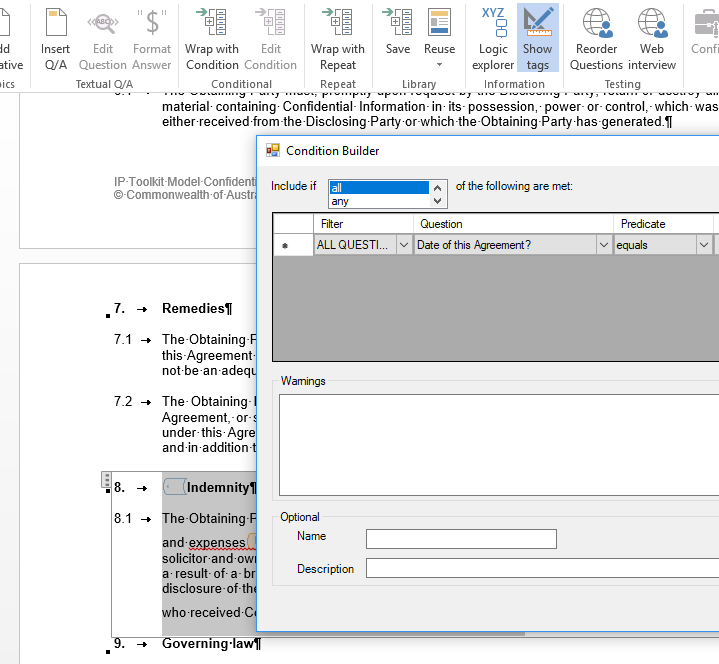 It works this way because this AddIn is aimed primarily at the interactive use case, that is, a user can answer questions in their web browser to generate an instance document. But the resulting template can be used just as easily for the more common non-interactive / entirely programmatic case. So click the “Insert Q/A” button. I did this with my cursor somewhere in the middle of the Indemnity clause. click next, then on the next page, choose type boolean (true/false), then ok.
You’ll see a content control inserted where your cursor was. We don’t really want that, so its a bit annoying (you can/should delete it). You’ll see why we did this just below. That’s all you need to do. We can now try generating an instance document from this template. How do you know what key to use? 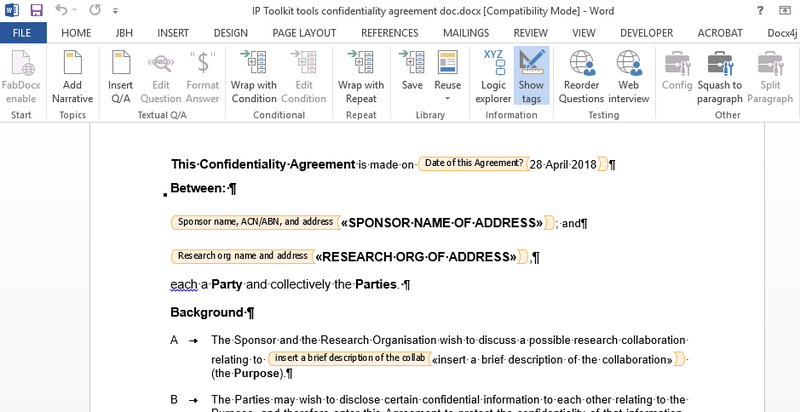 Look in the answers part in the docx and use the corresponding ID (yes, you should be able to see this in the AddIn, but the reason you can’t is that for the interactive use-case, you never need to know), or you can just invoke Docx4J.bind with debug level logging enabled for org.docx4j.model.datastorage, and it will print out the relevant part. That’s about it. If you have questions, they are probably best posted in the relevant docx4j forum or on StackOverflow.